The largest offshore wind project in the United States promises both renewable power and renewed opportunity for a faded factory town. When Troy Pritt was growing up in Dundalk, a red brick community on a flat spit of land between Baltimore and the Chesapeake Bay, he would listen as the adults around him talked about working at “the Point.” Years later, he followed in their footsteps. He spent 15 years on the galvanizing line at the mammoth steel plant on Sparrows Point, leveling buckled steel and performing quality checks. For Pritt and thousands of others like him, working at the Point was more than a job. It was who he was. Pritt managed to reinvent himself. He got a college degree; he found a job he loves in human resources. And now, with the recent approval of the nation’s largest offshore wind project in Maryland’s coastal waters, Pritt is hopeful that his hometown will also get its shot at reinvention. 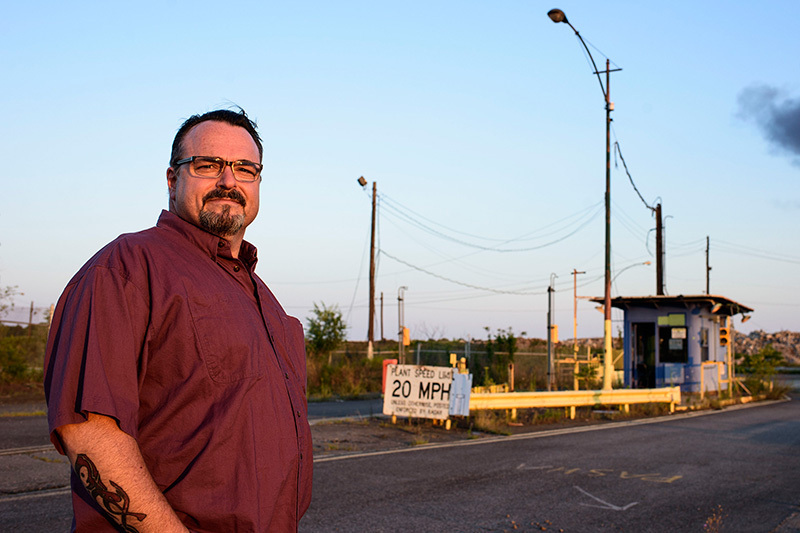 Sparrows Point could flip the “faded factory town” script with a new story about how environmental progress can generate economic sustainability. The wind project’s advocates, including Earthjustice, fought to intertwine the goals of producing renewable power with revitalizing this community. The jobs tied to the project will offer opportunities for those who stayed around and give Pritt a chance to put his new skills toward helping the area succeed. 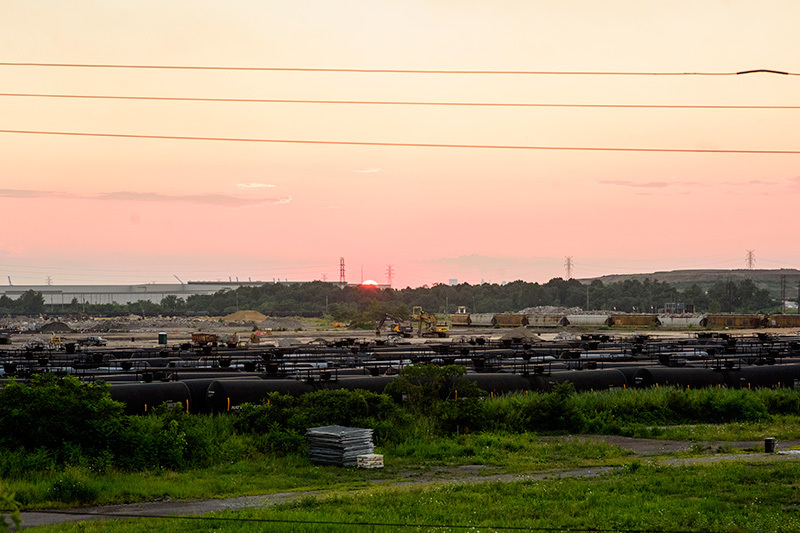 Sparrows Point is the former site of the Bethlehem Steel plant. Troy Pitt at Sparrows Point, July 31, 2017. Block Island Wind Farm off the coast of Rhode Island in Oct. 1, 2016. It could be soon joined by Maryland's project. In its heyday, Sparrows Point was home to the world’s largest steel plant, supplying the metal to make the Golden Gate Bridge, erect the Empire State Building and fight both world wars. By 1960, Sparrows Point employed at least 30,000 workers and had become its own town—complete with tree-lined streets, schools, churches, a fire and police department—owned and run by Bethlehem Steel. When the plant was sold and resold and finally closed in 2012, the number of workers had dwindled to 2,000. Now, the town is gone. The plant has been razed. It leaves in its wake a legacy of environmental degradation—new owners set aside $48 million to remediate the site—and lost opportunity. 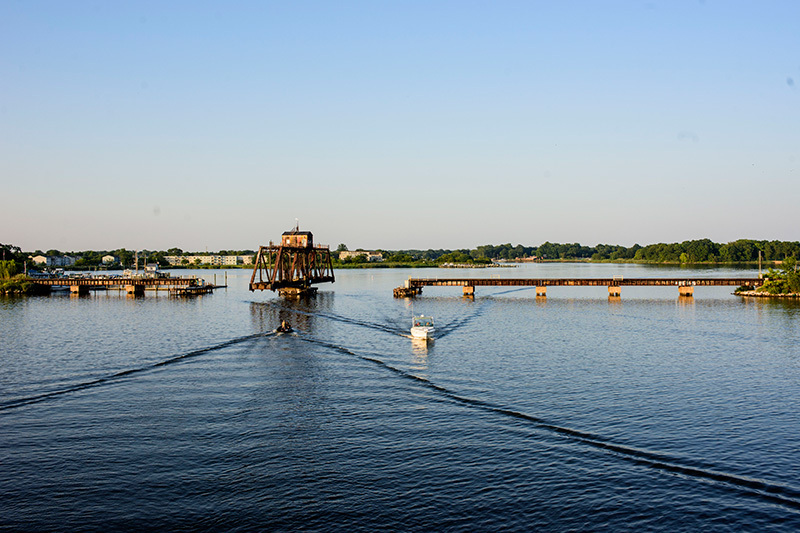 The Bear Creek Rail Road Drawbridge, in Edgemere, Maryland, was part of the Bethlehem Steel infrastructure. 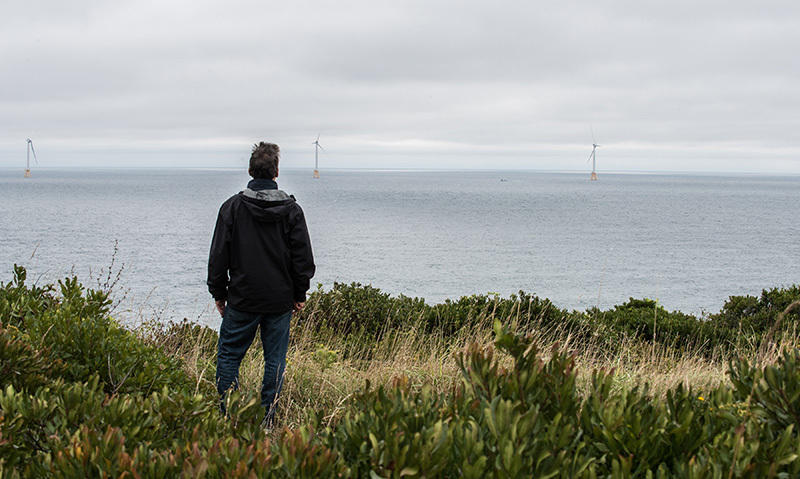 The offshore wind farm offers a second chance with a new kind of industry—one that would not only help revive the 3,100-acre area, but this time safeguard the environment by helping the state achieve a 25 percent clean energy standard by 2020. Local residents would not just see an influx of jobs. If the most ambitious visions are realized, workers will have a chance to once again help build the nation’s infrastructure. Just as their forefathers sent steel to New York’s skyscrapers, residents of Dundalk could be assembling turbines for projects up and down the eastern seaboard and beyond. 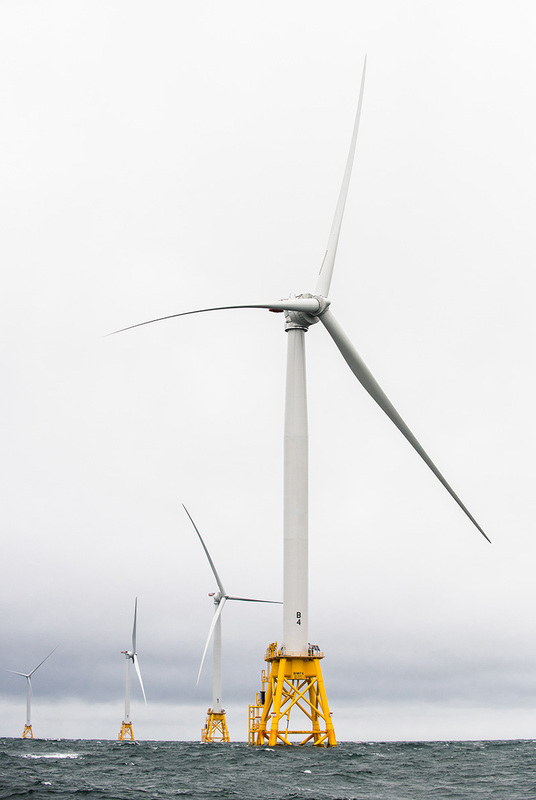 For now, the Maryland Public Service Commission (PSC) approved two proposals from U.S. Wind and Deepwater Wind to provide an initial capacity of 368 megawatts of offshore wind power. With the massive amount of infrastructure needed to support the proposed 77-turbine offshore wind farm—infrastructure that is easier to build locally rather than bring in from elsewhere—the project is projected to create 9,700 jobs and generate more than $1.8 billion of in-state spending. However, despite widespread support in Maryland and the PSC’s approval, the project could be in jeopardy before it even gets off the ground. Earlier this summer, Rep. Andy Harris (R-MD) introduced an amendment to the appropriations bill for the U.S. Department of the Interior to prevent federal funding from being spent on wind projects built within 24 miles of Maryland’s shoreline. The wind farm’s many benefits give its advocates, including Earthjustice, deep wells of community support to draw on in the coming fight to save it. Earthjustice attorney Susan Stevens Miller built a case for the offshore wind farms by tying the project to both environmental and economic progress. “For decades, dirty power plants have been placed in poor communities, with the universal justification that they are good for everyone. Now, with clean energy resources like offshore wind, we really can benefit everyone and harm no one,” said Earthjustice attorney Susan Stevens Miller. Miller continues to work to secure commitments from the developers to protect the environment during construction of the offshore wind farm. For example, she is working to ensure that any ships involved with the construction will safeguard endangered North Atlantic right whales and other vulnerable marine life. But Miller built a case for the project that went beyond environmental considerations. Representing the Sierra Club and Maryland League of Conservation Voters before the PSC, she argued for the project’s approval as a way to help modernize Maryland’s electricity system, to give the state greater control over its energy destiny—and to bring much needed economic development to a struggling part of the state. The wind turbines at Block Island, the country's first commercial offshore wind farm. The PSC’s approval of the project includes explicit requirements to ensure economic benefits for the local area. In fact, the PSC mandates that U.S. Wind and Deepwater Wind invest at least $39.6 million to support port upgrades at Sparrows Point and $76 million to build a steel fabrication plant in Maryland. Tradepoint Atlantic, the company that owns the Sparrows Point area, is eager to begin revamping the 150-acre portion that would support the offshore wind farm. In fact, the various companies looking to provide manufacturing support to the offshore wind farm all agree that the Sparrows Point site is favorable for development, according to Aaron Tomarchio, Tradepoint Atlantic’s vice-president of operations. “Maryland has an opportunity to be a real leader in offshore wind,” Viciana said. Inside the nacelle, the area that houses the gearbox, drive train, generator and other components of a wind turbine. 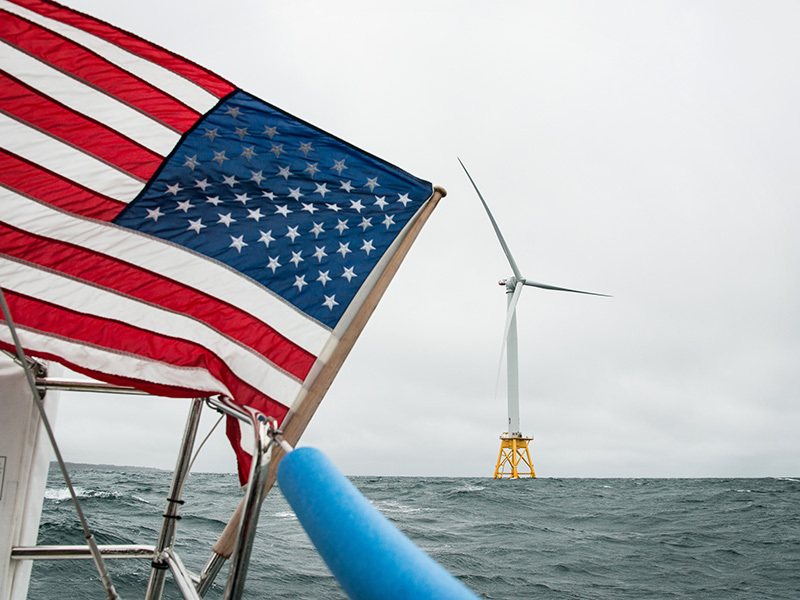 The offshore wind industry in the United States lags well behind Europe. As of 2015, the European Union had more than 3,000 wind turbines at 84 offshore wind farms in 11 countries, while the U.S. just launched its first commercial offshore wind farm in 2016—five turbines just off the coast of Block Island, Rhode Island. Europe offers a preview of the industry’s job-creating potential—75,000 jobs are attributed to offshore wind across the continent, many of them in shipyard or port areas in dire need of economic development, similar to Sparrows Point. The offshore wind industry creates more jobs than fossil fuels or even onshore wind because of the amount of manpower it takes to install, operate and service offshore turbines. David Roncinske, a representative with the Wharf, Dock Builders, Pile Drivers and Divers Local Union 179, has members trained and ready for some of these new jobs. 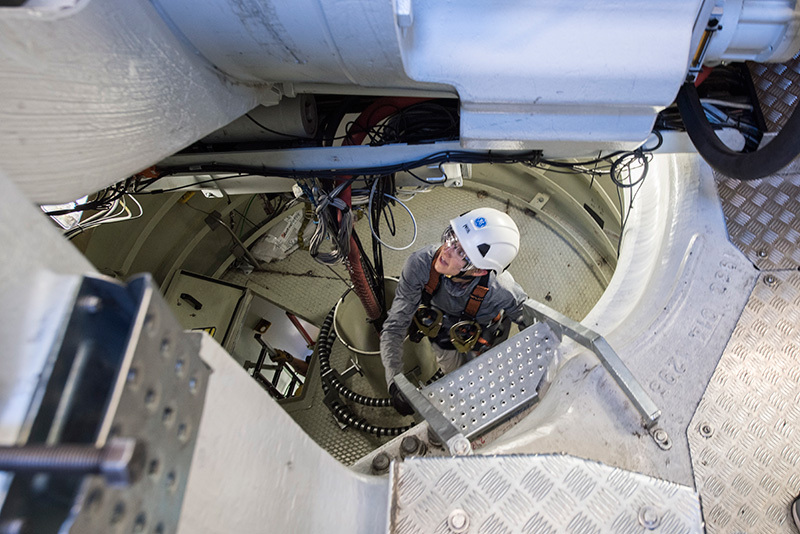 Many were involved in the construction of the five-turbine Block Island offshore wind farm, a project that brought 180,000 man hours for pile drivers alone. The wind turbines at Block Island, Rhode Island. The Maryland wind farm project is projected to create 9,700 jobs and generate more than $1.8 billion of in-state spending. The jobs of the future will be different than the ones of the past. Business and education leaders on Maryland’s Eastern Shore are also getting ready to support the new industry with a workforce training program to teach skills specific to the construction, development and operation of an offshore wind farm. For Sparrows Point veterans like Pritt, the past is prologue for what the future can be. “I’m excited to see opportunity there again, to see the Point anchoring the community,” he said. He looks forward to the day when once again he will hear people talk about working at “the Point,” in an industry that only has room to grow. 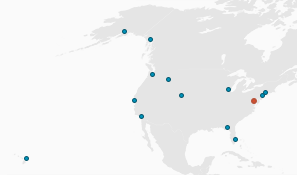 Earthjustice’s Clean Energy Program is based in Washington, D.C., with attorneys working in offices across the country. Using the power of the law and the strength of partnership, our attorneys are working to accelerate the transition to 100% clean energy. Transformational change will not come fast enough without key policy reforms and a concerted fight against industry interests that profit from business as usual. Learn more.